Toned and sculpted arms look very attractive. It is possible to get this without attending the gym and using special weights, especially for those people, who don’t like gym workouts. One needs a bit of motivation and these exercises to get the desired result. They will tone your arms perfectly with the help of your body weight, so you will have beautiful and toned arms. Your arms will be strong and well shaped. In addition to the gorgeous look, the strong arms will help you with your daily life routine tasks. The following exercises are quite easy, a no-brainer really, but you will love your toned arms after trying them out. They target bicep and tricep muscles, that constitute the perfect arm shape if toned enough. Follow this perfect arm workout! - Lean forward into an incline bench Using a neutral grip, hold a dumbbell in each hand so your palms are facing in. Your arms should be fully extended and hanging straight down. This is the start position. - Pull your shoulder blades back and flex your elbows to pull the dumbbells up to your sides. 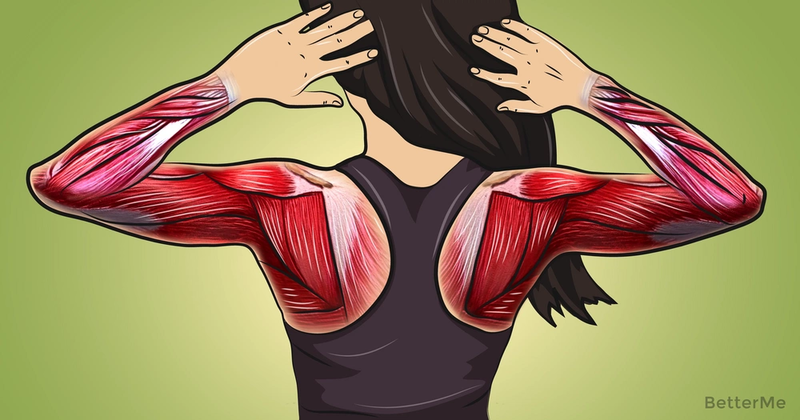 Hold and squeeze your shoulder and back muscles. - Return to the start position in a slow, controlled movement. Repeat. - Stand with your back straight, feet shoulder width apart, while holding a dumbbell in each hand with a neutral grip. Hold your arms fully extended by your side, with your palms facing in to your body. Keep your elbows close to your sides. This is the start position. - Keeping your arms fully extended and your torso stationary, lift the dumbbells out to your sides and up until they are at shoulder level. Exhale as you do so. Hold for a count of one while squeezing your shoulder muscles. - Return to the start position in a smooth controlled movement inhaling as you do so. Repeat. - Holding a dumbbell in each hand,stand with your feet shoulder width apart. The dumbbells should be resting on your thighs with your palms facing in. 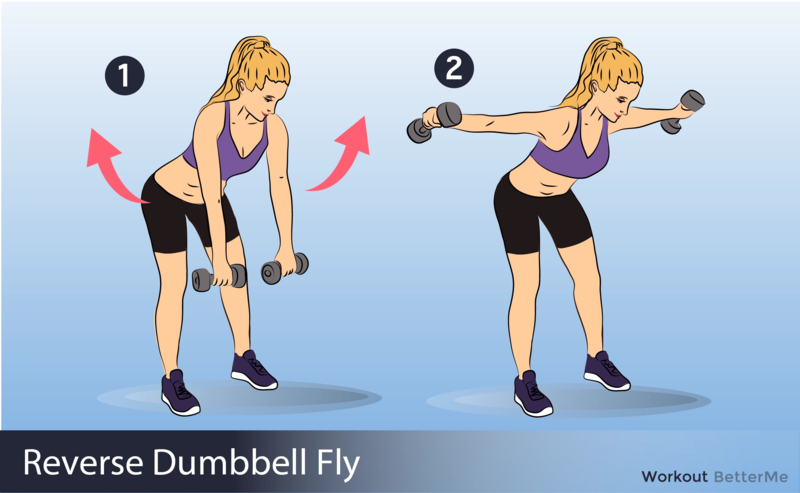 - Lift the dumbbells straight up in single smooth movement until they are just below your chin making sure to keep your shoulders back and your elbows out. At the top of the movement, flex or squeeze your biceps and forearms. Hold for a count of one. - Return to the starting position slowly to keep tension on the muscles. Repeat. - Place two dumbbells or kettlebells on the floor about shoulder width apart. In a push up position, place your hands on the grip section of each bell for support. Spread your legs to slightly wider than hip width apart with your toes supporting your weight. This is the start position. - Push down through one bell and at the same time “row” the opposite one upwards by retracting your shoulder and bending your elbow. Hold for a count of one. Your breathing should remain constant throughout the movement. - Lower the bell to the floor and without pause, then repeat the movement with your other arm. When you have rowed both arms, that is one repetition. Repeat for the desired number of repetitions. - Place a kettlebell on the ground. Step over the kettlebell so that it is in the center beneath you. Move your feet to shoulder-width or just outside of shoulder-width. Tighten your core and keep your chest up. - Begin by kicking your hips back and slightly bending your knees. Extend your arms down to grab onto the kettlebell. - Holding on to the kettlebell, drive your hips forward to stand back up. Slowly, reverse the movement by kicking your hips back and slightly bending the knees. Do not let your lower back arch. 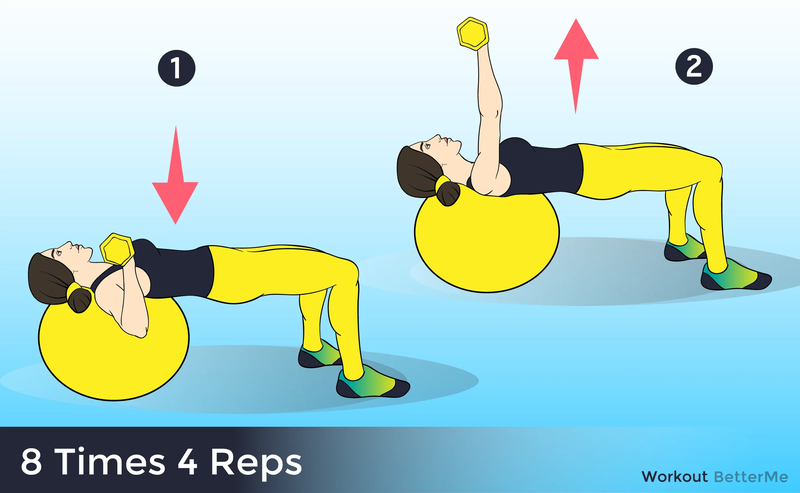 - Carefully sit on a stability ball while holding a pair of dumbbells. Slowly walk your legs forward while you lie back on the ball. Only your upper back and shoulders should be on the ball. - Keep a tight core as you bring your arms out to the sides, holding the dumbbells in a horizontal position. - Slowly, press the dumbbells straight up but do not lock out your elbow. Pause and return to the starting point. - Begin by holding a pair of dumbbells and standing with a braced core. Bend at the knees slightly and lean forward from the hips. Maintain a flat back throughout. - Keeping your elbows slightly bent throughout the movement, lift the dumbbells up and out to the side. Be sure to focus the contraction in the back of the shoulders. 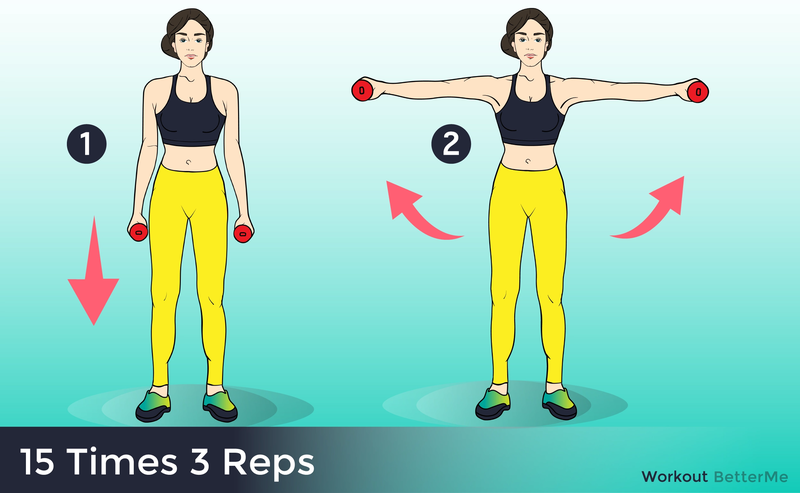 - Pause at the top of the movement then slowly bring the dumbbells to the starting position.